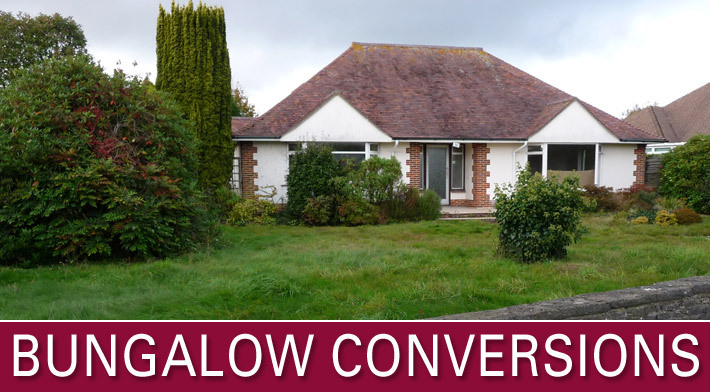 Roof conversion and renovation of existing bungalow consisting of 1 master bedroom & en-suite, 2 further guest bedroom & bathroom with extensive ground floor alterations & improvements. A complete renovation/conversion & dormers / gables. Extensive alterations to form three large master bedrooms/ensuite, new kitchen & double garage with driveway. Plumbing, heating & electrics. New raised roof and alterations incorporating 3 dormers/Velux windows/new porch, to provide three additional bedrooms & shower room, with refurbishment of existing ground floor. Loft conversion extensions/alterations to existing traditional roof, incorporating 2 front & 1 rear Dormer, to give two large bedrooms, new porch/shower room/utility room and 1.5 size garage with roof extended over. Loft conversion to semi-detached bungalow consisting of master bedroom and shower room with feature oak/glass staircase. Full roof conversion and alterations, incorporating three bedrooms, three ensuite showers, extended and enlarged hallway. Roof raised and altered with new gables, incorporating side dormer and Velux windows, to provide two bedrooms and shower room. Roof alterations incorporating new gable, front and rear dormers to provide two large bedrooms/shower rooms. Loft Conversion/alterations to existing trussed roof, incorporating 3 Velux Cabrio Balconies, to give three large rooms and very large shower/bath room. Roof alterations with dormer, Velux windows and new gables to provide two bedrooms and shower room. A complete renovation, conversion with dormers. Extensive alterations to form two large bedrooms & two shower rooms with new kitchen & enlarged lounge. New plumbing/heating/electrics. Roof alterations with new rear gable/dormer/Velux windows to traditional bungalow to form a master bedroom and large bath/shower & room/landing. Loft conversion with rear flat roof dormer and front Velux windows, providing one large bedroom and ensuite shower room. Roof raised and alterations incorporating front and rear dormers, to provide 2 bedrooms and bathroom. Roof alterations with new gables, dormers & Velux windows to trussed roof bungalow to form two bedrooms with shower room & landing. Roof raised incorporating front and rear dormers to provide two bedrooms and shower room. Loft Conversion with front dormers and rear Velux windows to provide three bedrooms, main bathroom and ensuite shower room.